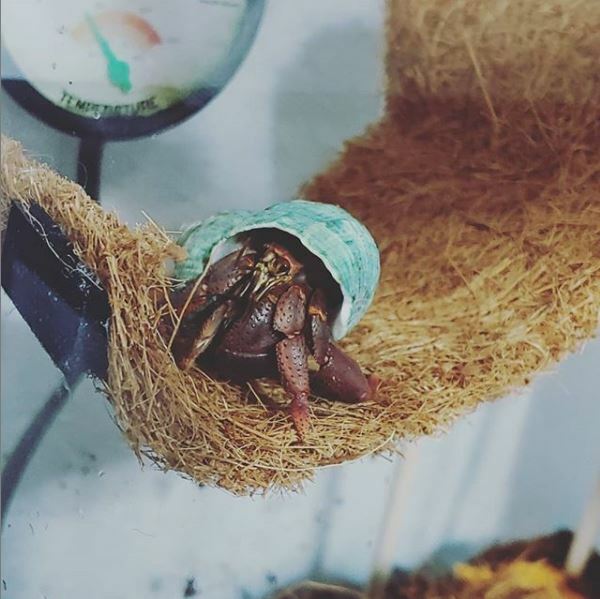 I've had my hermit crabs for a few months, and we have had one new addition to the family, but a tank had a crack after a mishap and had to be replaced in a rush. Currently the crabs are in the Zilla Vertical Tropical Kit, 12x12x18. 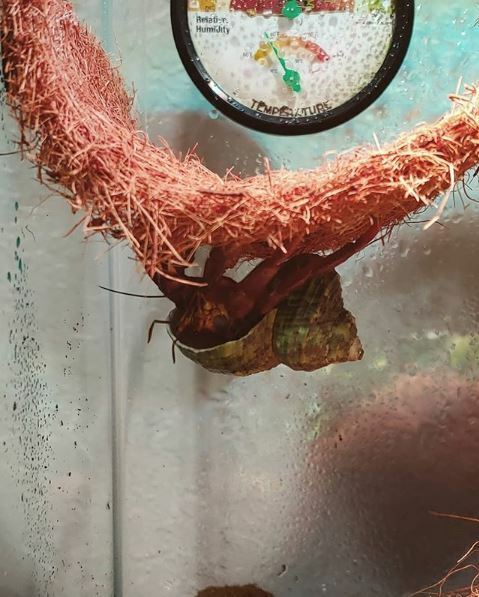 The door to the tank is just over 6 inches from the bottom, which made measuring the substrate amount easy and gave room to manufacture a temporary climbing toy for them, but it is too small. Within the next month I plan on having a new crabitat setup for them, but I can't find an ideal tank. There are 3 of them, so I want a minimum of a 20 gallon tank with roughly 16" of height so that I can still have 10" of room to put in climbing toys and such after substrate is in. Do you have any tank suggestions that could fit the requirement? I also have the following in the tank at this time, would you have any ideas for improvement? Currently the tank stays with a high of 78 degrees during the day, and low of 72 degrees at night, with an average of 60-85% RH due to the fogger on intervals. Hi! Welcome! What size would you say the crabs are? Honestly, I would say the bigger the tank the better. Check for deals on craigslist, OfferUp, Letgo. The crabs will grow and you may also want to get more. They're addicting. I know many people use foggers but you have to be careful. They can create flooding. The water bowls have to be large enough for the crabs to fully submerge, with a safe way of getting in and out. What kind of crab food are you feeding them? Most things marketed for crabs isn't good at all for them. Make sure they have protein and calcium daily. Check out the safe/unsafe food list under the care guide. Are you using a digital thermometer/hygrometer? Humidity has to be a minimum of 80%. At all times. This can be accomplished with a sealed lid; moss pit, and substrate that is sandcastle consistancy, which is imperative. Bulbs tend to dry out any humidity. The best heater is the Ultratherm, sold by beanfarm.com and reptilebasics.com. You need it large enough to cover the entire back of the tank from the top of the substrate to the top. They are also the only heaters that can be insulated. Right now, Bob, our biggest, can fit comfortably in my palm. I'd say he would be categorized as "medium". Shell openings are roughly an inch, slightly larger, and he fits comfortably in his turbo. I can see about attaching pictures later. Right now they just have wading bowls. There isn't enough room to put in a pool that the PPs can fully submerge in. As to food, it is the store bought food. I will be reading through the safe/unsafe list later and building a shopping list for them. To ensure they are getting calcium, i'll start using egg shells and the like, but I need to check for fitting sources of protein. Currently the temperature/hydrometer is analog. I havn't looked into digital yet. A sealed tank won't be possible until a new tank is gotten, because the swinging door on their temporary tank does have a gap that is pretty noticeable. This will be something I plan for their larger tank. Was thinking of adding the wading pools and could use a larger dish to isolate the moss pit. 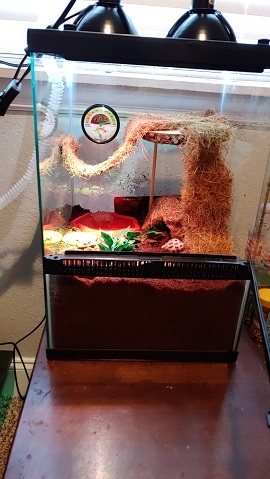 The new crabitat setup will start on Friday, so Christmas is coming late for the little guys. I'll start hunting through craigslist, and Letgo to see if I can find a suitable tank for them. I'll need to review the ratios for sand to substrate. Right now it is all eco earth substrate. I want to be able to have night viewing since I am a night owl. I'm normally up into the AM. Any ideas for bulbs that could be used that don't have as much impact, or would this just be the natural trade off for using a bulb? This is the temporary crabitat that i'm looking to move the PPs out of. It is rather cramped, but they have not been in it for long. It's just finding a good sized tank that is the problem. Here's a few picks of Bob. He is the most active, both day and night. He likes to sit on top of the coconut when he's not climbing about. Just sits there like a sentry. Hermiesguardian wrote: Hi! Welcome! What size would you say the crabs are? Honestly, I would say the bigger the tank the better. Check for deals on craigslist, OfferUp, Letgo. The crabs will grow and you may also want to get more. They're addicting. I know many people use foggers but you have to be careful. They can create flooding. The water bowls have to be large enough for the crabs to fully submerge, with a safe way of getting in and out. What kind of crab food are you feeding them? Most things marketed for crabs isn't good at all for them. Make sure they have protein and calcium daily. Check out the safe/unsafe food list under the care guide. Are you using a digital thermometer/hygrometer? Humidity has to be a minimum of 80%. At all times. This can be accomplished with a sealed lid; moss pit, and substrate that is sandcastle consistancy, which is imperative. Bulbs tend to dry out any humidity. The best heater is the Ultratherm, sold by beanfarm.com and reptilebasics.com. You need it large enough to cover the entire back of the tank from the top of the substrate to the top. They are also the only heaters that can be insulated. Thank you for the suggestion about OfferUp and Letgo. I've found a large terrarium that someone was originally using for a boa for pretty darn cheap. It's 30"x12"x13" which is enough for me to work with. I have updated my amazon list for the new terrarium with several items you suggested, such as a digital therm/hygrometer and the ultratherm UTH. Just want to thank you again for the help. Once I can order the new supplies and get the crabitat setup, I will update with pictures. You're welcome. Would love to see pics! Just a quick update on the crabs. I purchased the 30"x12"x13" terrarium, and they have been moved over. Since we didn't have clear lid, I used plastic wrap on the mesh lid to help keep humidity in. In order to maintain the humidity at 80%, the fogger is still having to be used. I am checking the substrate daily for flooding. They have been removed from store food entirely. This week's menu consists of carrots, chicken, and oranges. The new terrarrium also has a small moss pit, some false foliage, and two branches for climbing. Bob and Mr. Crabs prefer to hang out by the moss pit and foliage rather than go into their coconut huts now. Their watering dishes are gone, and instead have been replaced with tupperware containers. The containers are deep enough for them to fully submerge, and have pond stones and netting to help them climb in and out. Prime and Instant Ocean were available locally, and is now being used with tap water to provide the appropriate water they need. Mr. Crabs loves the baths, and will crawl in voluntarily, but Bob is still wary of the water. I don't think he has ever been submerged before. Lighting is currently an issue. Because of the wire mesh and the plastic wrap, it is dark in their terrarium. I want to replace the lid entirely in order to provide better lighting conditions, improve visibility, and still contain moisture. What suggestions do you have in order to accomplish this? I need to have access ports to feed the air tubes for the bubble stones and the fogger into the terrarium. There is an Ultra therm connected to the tank now. It spans 4/5 of the tank's width, placed at the substrate's surface. In another forum, I discovered one of our crabs was missing a claw, and was advised it was likely post purchase syndrome. Unfortunately, Tamatoa did not make it. I found them opening up the other day, and had a dead fish smell coming from them. They had no signs of a fight or being pulled out of their shell. It was upsetting to find, and I am not sure how to prevent this in the future.